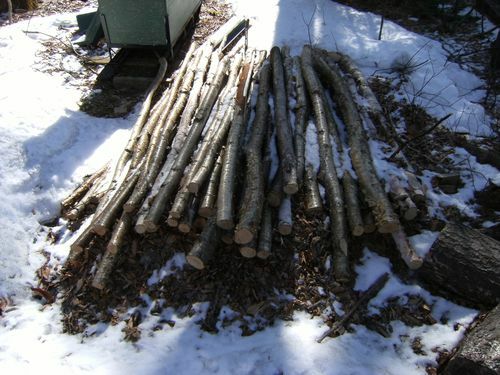 Yellow & White Birch Logs #6: Or what I'm waiting to do! Spring has sprung,... yeah right, coulda fooled me!.... My pile of Logs that I did not peel has finally appeared from under its winter slumber, I am going to start selecting and peeling for my next piece of furniture “Log Couch and end tables”. I have the logs to do all the slats and posts but not any long enough for the rails and I want to get a New arched piece for the top rail, Problem is There is still over 2’ of snow on the ground at the Camp in Northern Vermont. Looks like I wont be able to drive in till the end of the month to get that piece. My Daughter and Step Daughter both sew and have volunteered to make the cushions, just need to find the right fabric, maybe moose’s.